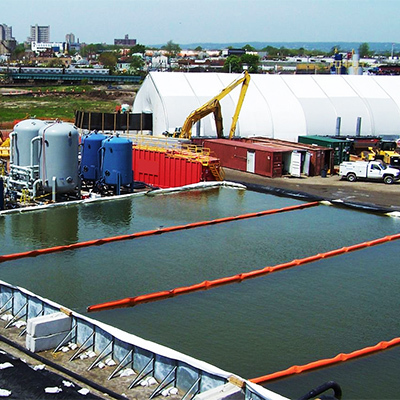 Floating baffle curtains are used in wastewater treatment lagoons and other predefined structures to increase retention time. Lagoon baffles divert the flow within an existing lagoon or pond creating a serpentine pattern that increases the practical treatment or settling area within the lagoon. A properly designed baffle system can reduce or virtually eliminate dead zones as well as short circuiting. 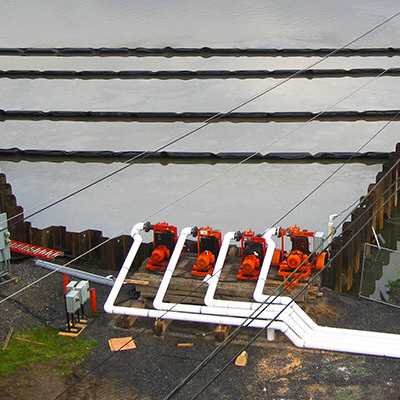 Spilldam Environmental baffles are a cost effective solution to retrofitting an inefficient or overwhelmed treatment pond without reconstruction. Our baffle curtains can be manufactured from a variety of materials suitable for nearly any application and are custom designed for each installation. Optional features include: Flow through windows, filter panels, skirt retrieval lines and extra ballast. Please contact our offices to assist with your application. Boom Length 50 ft. or 100 ft. sections Other Lengths Available. Floatation Element Cylindrical, internal closed cell foam. Curtain Depth 3 ft. to 75 ft.